This Classic Eclair recipe is a Pate a Choux based hollow pastry shell filled with creamy custard, then dipped into a shiny chocolate glaze. This is a simple, yet sophisticated and all around delicious Chocolate Eclair Recipe! Here you’ll learn the tips and tricks on how to make eclairs. You’ll love this recipe for eclairs with the perfect hollow shells and the creamiest custard filling. Pin this Eclair Recipe to your PINTEREST board! I love eclairs, the taste of the pate a choux with the custard is a heavenly combination. We have a local French boulangerie that sells eclairs and we always get one when we are there. One day, I just had to recreate them and came up with this homemade eclair recipe. These delicious pastries may take some time, but they are so worth it in the end! Trust me! They taste even better with the pretty crystallized mint. 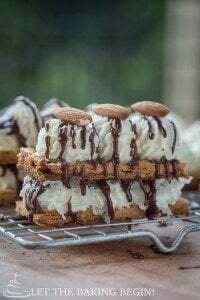 😉 Keep reading to find out how to make these delicious chocolate eclairs, and the crystallized mint. The mint leaf is optional though, so add it if you want, but don’t feel like you have to. Do you have a step by step photo tutorial of the pâté a choux recipe? Well yes, I’m glad you asked! Click here to see just how simple the process is. Once you see the step by step pictures, everything becomes so much more clear! What is the difference between Eclair and Profiterole? They taste the same, they’re made with the same ingredients, so why the different name? It’s all in the shape. The round shaped, custard or sometimes whipped cream filled pâté a choux pastries are called profiteroles, and the log-shaped ones are called éclairs. There are two types of custards that you can fill éclairs. One with a gelatin-based cream, and one that’s just custard based one. I went with the non-gelatinized one this time. I figured most people don’t have unflavored gelatin just lying around the house, but definitely, do have some all-purpose flour. What other fillings for Eclairs can we use? Try this Mousseline Cream, or this Coffee Flavored Custard, as a substitute for the Classic Custard filling. The Eclair below is filled with the Dulce de Leche Mousseline Cream. 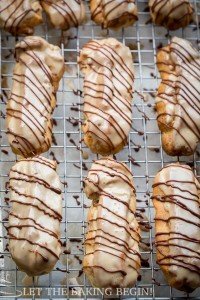 What is your favorite filling for Eclairs? Maple Glazed Coffee Eclair – The combination of the coffee custard with the maple glaze made into delicious eclairs. Cream Puffs – Light as air pate a choux shell, filled with lightly sweetened vanilla whipped cream – it’s a match made in heaven! Basic Macarons – Italian Meringue Method – A deliciously simple recipe for macarons! 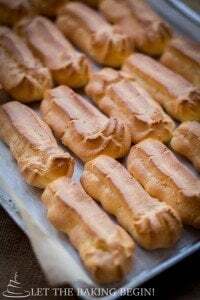 This Classic Eclair recipe is a Pate a Choux based hollow pastry shell filled with creamy custard, then dipped into a shiny chocolate glaze. Simple, yet sophisticated and all around delicious chocolate eclair recipe! Whisk the egg yolks & sugar and flour together in a large bowl, add a little bit of milk if mixture it too thick and difficult to whisk. Slowly pour the milk into the egg yolk mixture, continuously whisking. This is called ‘tampering the yolks’. Pour the mixture back into the pot and bring to a boil, continuously stirring and going along the bottom of the pot in zigzag motion with a rubber spatula, to prevent scorching. It WILL stick if you stop. Add the vanilla extract & butter. Allow the butter to melt and stir for it to incorporate. Cover the custard with plastic wrap it touches the custard. To speed up the process you can transfer the custard into a jelly-roll pan, spread it thin, covering with plastic wrap will avoid skin formation. Refrigerate until ready to use. Fit a pastry bag with plain 1/3 inch tip nozzle and drape the bag over a large glass. In a heavy bottom saucepan combine, milk, water, butter, sugar & salt. Bring to a boil. Once the mixture is at a rolling boil, add the flour all at once, reduce heat to medium and start mixing the dough with a wooden spoon vigorously. Continue doing so for another 2-3 minutes to evaporate some of the moisture. 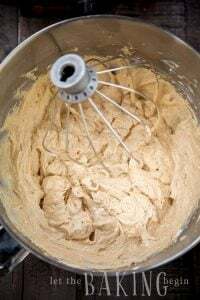 Transfer the dough to the bowl of a mixer fitted with the paddle attachment and start stirring the dough on medium speed for 1-2 minutes to cool it down slightly. Add the eggs to the mixture in 4-5 additions, each time allowing the mixer to incorporate the eggs fully before adding more. The dough might separate at first, but it will come back together as you continue stirring and adding more eggs. The mixture should be thick but still fall off the paddle attachment in a thick ribbon. You might not add all eggs before this happens. 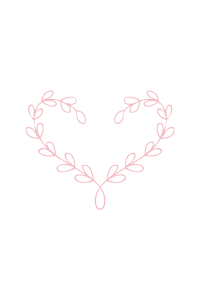 It is ok. Transfer the warm dough to the piping bag and pipe out 2-3 inch logs, about 2 inches apart. Place the first baking sheet in the oven and bake for 15 minutes, then reduce the heat to 375F and continue baking until golden in color, about 25 minutes. DO NOT open the door before the éclairs are golden, they will deflate. Keep the other sheet with piped logs in the freezer or refrigerator until the first sheet is out of the oven. Allow the éclairs to cool. Combine all ingredients in a heatproof bowl, set over a pot of simmering water. Bottom of the bowl should not touch the water. Warm up the mixture and allow the chocolate to melt, stirring it occasionally. Do not overheat. The mixture should only be warm, not hot. Take off the heat and allow the chocolate to completely melt, stirring it every couple of minutes until chocolate melts. Wash and dry thoroughly each leaf. Set egg whites in a heatproof bowl, over simmering water and heat, stirring continuously until 140 degrees, or pretty hot to the touch. Allow the egg whites to cool. Dip each leaf into the egg whites, allowing most of the egg whites to drip off. The leaves should only be damp with egg white. Dredge each leaf in the sugar on both sides and set on a paper towel or a cooling rack for sugar to harden up. Fill a pastry bag fitted with a plain 1/4 inch star/plain tip with custard. Fill each éclair with custard by inserting the tip into the top of the pastry in 3 places, closer to both ends and in the middle, and squeezing the custard in until it almost starts to come out. Wipe off excess. Leave for 15 minutes for the skin to form in the places where you inserted the custard. Carefully, dip top of each éclair into the chocolate glaze. Top with 1 mint leaf as a decoration. I made these, and they were easy enough, and taste beautiful. Everyone loved them. the only problem that I had, was that when i followed the instructions for size and cooking time, they would have ended up very overcooked if i had not spotted that they were getting overdone early in the cooking process, and turned the oven down, and taken them out a fair bit earlier. next time i will make a larger version and adjust cooking time to suit. Thank you for your feedback and the star rating! Each oven is different, so it’s not calibrated properly it might need more or less time than indicated in the recipe. I’m glad you were able to figure out proper timing for your oven – good job! As long as the eclairs are baked until they hold their shape and don’t collapse when they are removed from the oven, they’re done. Dulce De Leche Mousseline Creme - Let the Baking Begin! These were delicious! I whipped up 1/2 cup heavy cream and added it to the custard to lighten it up. I think it just adds a nice lift to the cream, although it is of course delicious without the cream as well. I used Ghirardelli milk chocolate chips for the chocolate glaze. Yum! Also, they aren’t as hard to make as you might think! Just time consuming. Lots of fun to make with a baking buddy! My first time trying to make eclairs! They turned out so well! Thank you for an easy to follow and delicious recipe! Thank you so much Rebecca for your feedback! I’m glad it all went well! I made eclairs for the first time yesterday! Your recipe was easy to follow, and they taste great!! This recipe looks delicious!! Am I able to use an electric mixer? I don’t have one of those big fancy ones yet! Thank you. Sure thing, any mixer will work. In fact, for this recipe even a spoon or a whisk will work. Oh thank you so much for your nice comment, appreciate it much! I’m glad you enjoyed this recipe! I hope you give the coffee flavored eclair a try, next. I came looking for a recipe that would use up my leftover egg yolks from making macarons and I stumbled across your recipe. I was very pleased with the outcome and it tasted delicious (although I got lazy and opt for nutella as the chocolate glaze lol). The recipe was easy to follow and make, thank you! That is a pretty genius idea, must’ve been delicious! 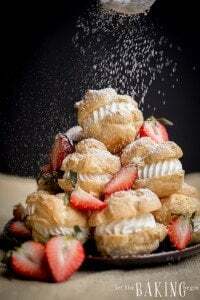 This pate choux recipie is too wet. Less eggs, more flour. They rise well but are too soft. Needs more chew. Pastry cream is too loose and flour adds a raw flavor, even when cooked well. I have had years in the business and should have just texted my pastry chef. Sous Chef Brandon is angry!!!!!! I’m sorry things didn’t work out. I think there were a couple things that you did wrong an that’s why you got the results you did. Before I explain what I mean, I wanted to mention that he recipe for the eclair shells is by Pierre Herme, a famous french pastry chef who has a very successful bakery in France and business overall, so before I even tried this recipe I knew it was going to be a good one. If the choux recipe seemed too wet, it could be that you should have stirred the dough a little longer to evaporate more moisture before adding the eggs. The pastry cream, as evidenced by the pictures you see with the recipe, can not be too loose as it holds itself inside the shell when cut in half, without oozing. The looseness and the raw flour flavor, could come from the fact that the cream should have been cooked a couple minutes longer. When you work with pastry cream with flour as the thickener, the cream needs to be cooked until it has thickened and until the raw flavor dissipates. These look great! I don’t mean to be rude, but it’s “tempering” the eggs, not tampering. Yeap, you’re right! Thanks for catching that! Hello, how many grams are 1/2 and 2/3 of stick butter? 1 stick butter is 113 grams, so 1/2 is about 56 gram, and 2/3 is about 82 grams. These look great!! How long will they keep for? Because custard contains eggs, I would not leave it for more than a couple days. These look perfect, although somewhat complicated to make. Pinned! What a beautiful addition the candied mint leaf makes! Your eclairs look perfectly delicious! Oh they look stunning! I could definitely go for one homemade eclair!